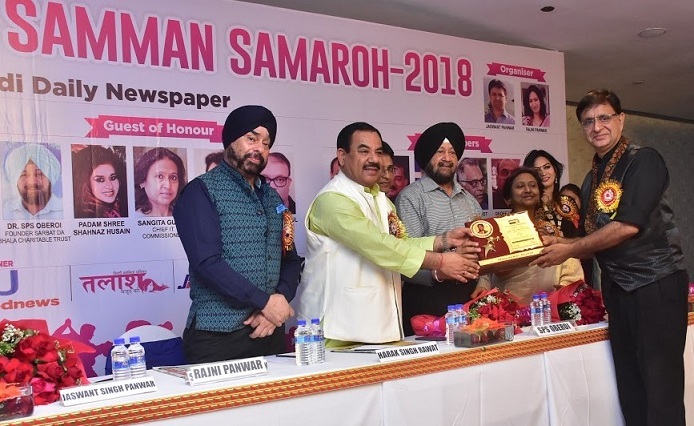 Rajni and Jaswant Panwar, founders of Namaskar Dunia, a leading Hindi Daily published from Delhi and Dehradun, hosted a glittering awards event “Pratibha Samman Samaroh 2018” at The Park, New Delhi on 30th March’2018. The highlight of the evening was the felicitation of various achievers who had brought rich laurels to the country. The Chief Guest of the event was Harak Singh Rawat, Cabinet Minister, Uttarakhand Government while the Guest of Honours boasted of personalities like the renowned philanthropist Dr SPS Oberoi (Founder of Sarbat Da Bhala Charitable Trust), Sangeeta Gupta (Chief Income Tax Commissioner) and Hotelier KS Kochhar (Chairman Taurus Hotels). Sportspersons alongwith other achievers were honoured during the course of the event by the Chief Guest and the Guest of Honours. The event coincided with the 8th Inauguration Day of Namaskar Dunia Newspaper celebrated every year on 30th March’ 2018. The jury panel was headed by Chairman Vinod Painuly who happens to be a Consultant for ONGC & Abdul Kalam Centre and University, Ranvir Gehlot, Jaswant Singh, Rajni Panwar, Arun Sharma, Jaideep Dhagat and Geoff Lyonne. Rakhee Bakshi as the Anchor of the event was simply brilliant. Speaking on the occasion, organizer and Editor Rajni Panwar said, “In the past seven years of our existence, Namaskar Dunia has tirelessly addressed myriad germane issues concerning the society and the nation as a whole, besides crusading against deep rooted corruption, and exposing all those behind it. More significantly, we have also sincerely endeavored to fulfill our social responsibilities by supporting the weaker sections of society from time to time. We are extremely grateful to Sarbat Da Bhala Trust and ONGC for sponsoring our event. It was a matter of great honour that Dr SPS Oberoi gave special cash prize of 11,000/ to some of the sportspersons. Pratibha Samman Samaroh 2018 was organized to honour all the deserving talented achievers of the country. Vikas Sharma bagged the most inspirational entrepreneur of 2018 award. In a short span of time, he has become a force to reckon with, in the Real Estate Industry having achieved phenomenal success. His real life tale is really inspirational and countless of wannabes aspiring to make a mark in life, can simply take a leaf out of his books! No wonder, this is what has earned him the sobriquet, the ‘Game Changer’. Renowned Microsurgeon and Author Dr Anuj was honoured with the Lifetime Achievement Award for dedicating a lifetime to the profession of medicine. He is presently serving as the Director of the Microsurgery Centre of Agra and has been a visiting hand surgeon to various hospitals including the USA, Switzerland, Taiwan, Hong Kong, Australia and Thailand. Notable among other awardees included names like Rosy Ahluwalia (Fashion Designing), Sangeeta Gupta (Writer & Artist), Ikrant Sharma (Lawyer),Rakhee Bakshi (Best Anchor Award), Upasana Aggarwal (Social work), Sarvesh (Photo Journalism), Kesar Singh Bisht (journalism), Khagolim Negi (Stand up comedy), Kiran Bhatt Tadoria (Entrepreneur), Jyoti Gulia (international boxer), Kushagra Rawat (national swimmer), Lalit Mathur (international Athlete/Olympian), Ali Abbas Naqvi (journalism), Anu Singh (National Junior athlete), Firdaus Kayamkhani (Swimming), Rattan Singh Gunsola (Technocrat), RK Rana (PR & Publicity), and Nitu Dhanana (Boxing). Another fascinating feature of the event was the honouring of women achievers from different fields. Those honoured included icons of their field namely Archana Anuj (artist and , Shalu Jain (founder of Tia Jewels & Sarees), Chhaya Raj Mittal (Energy and Life Coach), social activists Usha Thakur & Sudha Sharma, style diva and entrepreneur Poonam Saini, renowned Ghazal singer Hema Sharma, dietician and nutritionist Shikha A. Sharma, Founders of Kany Club Madhu Goel, Anuradha Khanna and brand accelerator and digital media strategist Shiwangi Srivastava.